I recently picked up a number of issues of Adventure Comics from the 1960s which depict the adventures of the Legion of Super-Heroes. In some of them, both Superboy and Supergirl are members simultaneously, which got me thinking about the convoluted story of how that was possible. According to the canon of the time, Supergirl occasionally traveled to the 30th century from her time--ie, the real-world time the stories were being published--to work with the Legion. Superboy did the same, but he traveled from his own time, which was (I would suppose) 15-20 years prior to Supergirl's, since the Superboy of that era was Superman himself, as a boy. 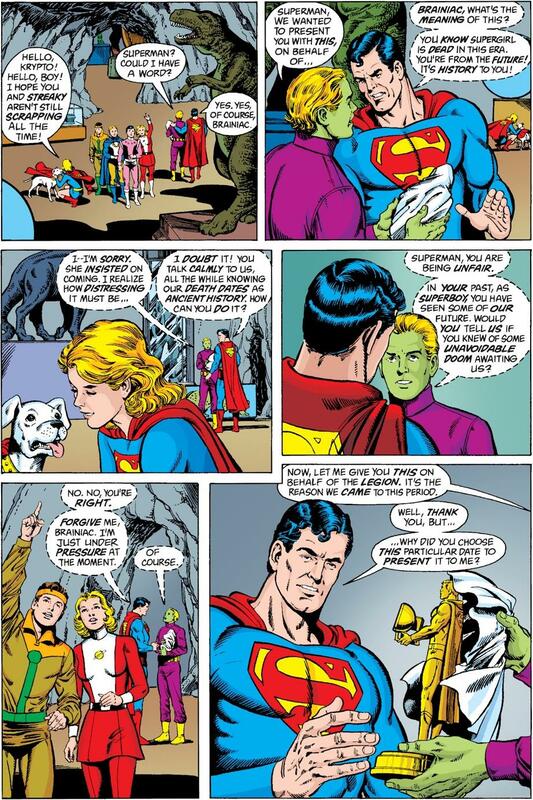 To prevent Superboy from knowing details about his own future--in particular and most obviously, Supergirl's very existence, which he was originally unaware of until he met her as an adult--a post-hypnotic suggestion was implanted in him which caused him to forget all knowledge of his own future every time he returned to the past. Whew! So anyway, what I'm wondering is if Superman was ever depicted as regaining his memories of teaming up with Supergirl as a kid. If so, in what comic? "Realistically" (heh) it hardly seems plausible that he could have remained forever ignorant, since that scenario calls for him to never notice Supergirl's trips to the future, and her never mentioning them to him. Also, there would seem to be no further need for him to remain ignorant of his future, because by the time he grows up to become Superman, he is in his own future. But I'm looking for an explicit depiction of his memories being restored. In Alan Moore's classic story Whatever Happened to the Man of Tomorrow?, set at the very end of pre-Crisis continuity, Superman is visited by members of the time-traveling Legion, including Supergirl, and he's unfazed by her presence. (Well, I guess fazed a little bit, since the Supergirl of his own time had recently perished in the Crisis on Infinite Earths.) This story implies that he regained his memories at some point, but since the story is an "imaginary tale," this doesn't seem very conclusive. And in any event, I want to know if the restoration was ever explicitly depicted. Since the whole purpose of the "post-hypnotic suggestion" was to keep Superboy from learning anything about his future life, the implication was that as such memories could no longer do so, he would remember them. But I don't believe it was ever explicitly stated. I do think that Superman was more than a little fazed by Supergirl showing up with the Legion in "Whatever Happened to the Man of Tomorrow". He seems to be chewing Brainiac 5 out in this panel. Not the answer you're looking for? Browse other questions tagged dc superman supergirl or ask your own question. Why did Superman & Supergirl start to suffocate instantly when Luthor made our yellow Sun red? What color is the sun of Apokolips? Are there conditions to Superman's appearances in Supergirl? How did Superman know Supergirl was his cousin? What three Kryptonians were on Earth in 2006? How did DC Comics reboot Superman in 1986?